^ 2.0 2.1 高, 春明. 《中國衣冠服飾大辭典》. 上海: 周汛. 1996. ISBN 7-5326-0252-4. ^ 4.0 4.1 4.2 4.3 周, 星. 汉服运动：中国互联网时代的亚文化. ICCS Journal of Modern Chinese Studies. 2012, 4: 61–67. ^ 5.0 5.1 5.2 5.3 Sandra Lee Evenson. Hanfu Chinese robes. (编) Annette Lynch; Mitchell D. Strauss. Ethnic Dress in the United States A Cultural Encyclopedia. Rowman & Littlefield Publishers: 135–136. 30 October 2014. ISBN 978-0-7591-2150-8 （英语）. Chinese hanfu robes are full-length wrapped garments with bell-shaped sleeves extending over the hand. The front left opening is extended to a triangle shape....When wrapped, the contrat banding creates a dramatic play of line and color. 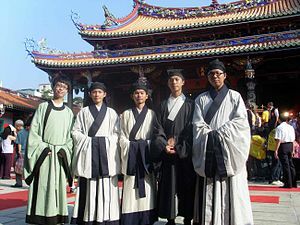 Both men and women wear the haunfu; however, the overlap on the men's style is less extensive. In the Disney film Mulan, the title chracter wears a hanfu to visit the matchmaker. History The term "hanfu" means "dress of the Han people." It is based on the two-piece, fitted shenyi of the Warring States period (475-221 BCE). ....By the Han dynasty (206 BCE-220 CE), the one-piece version emerged as a long voluminous linen or silk robe in vivid, contrasting primary colors. Manchu people from the northeast founded the Qing dyansty (1616-1911 CE). 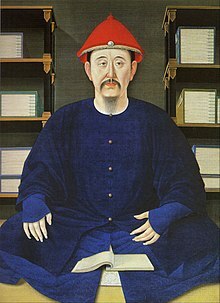 ...To expunge the Han identity, Qing rulers prohibited Han national dress and require them to wear garments in the Manchu tradition. Han resistance was so severe that the policies were modified. Men, government officials, Confucian scholars, and prostitutes wore the Manchu style; women, errand boys, children, monks, and Taoists were free to wear Han styles. Han dress was also permitted for special occasions suc as weddings and funerals. During the Republic of China period (1911-1949 CE), Euro-America lifestyles and products influenced Chinese dress, representing a shift from dynastic to popular rule.... After the revolution in 1949 and the founding of the People's Republic of China, both traditional dress and world dress were rejected in favor of Mao suits and boxy cotton jackets and pants for bot men and women. Communist leadership discouraged reference to historical clals hierarchies and modern capitalistic values. As a result, traditional Han dress was relegated to ceremonial use. With the liberalization of the Chinese economy, interest in national dress prompted a search for popular, authentic, and intrinsically Chinese styles. ... Because of its proportions, the hanfu is impractical for everyday dress, but is worn in China for Mid-Autumn Festival and for a new created coming-of-age ritual. Some favor the hanfu as a prototype for China's acaemia regalia. On the other hand, the hanfu resembles the Japanese kimono and Korean hanbok, both based on Chinese robes. Some scholars note that this cultural authentication of styles blurs the geopolitical boundaries of what is authentically Han. Infusion of Chinese-American aesthetics and meanings may further complicate identifying an intrinsically Chinese national dress. Hanfu in the United States Han dress arrived in the United States with Chinese immigrants in the nineteenth century. Male laborers tended toward Manchu jackets and pants for work on the pineapple and sugarcane plantations of Hawi'i, in the gold fields of the American West (1848-1855 CE), and on the transcontinental railroad (1863-1869 CE). Over time, their families joined them, bringing traditions such as ceremonial dress. In the United States, the hanfu is sorn as ethnic dress for special occasions through out the life cycle. Women's hanfu are billowing and fluid, with extended sleeves, trailing ribbons, and swaying dangles. Accessories range from the very traditional to the fashion forward, similar to the trending of other wedding dresses in America. Men's styles are more restrained, but equally elegant. Influence and Impact Euro-Americans often identify the hanfu as traditional Chinese dress, inspiring Seventh Avenue, Hollywood, and individuals alike. In addition, when times change, dress is often the stage where the negotiation of cultural values play out. The hanfu has been that stage, both historically and in the twenty-first century. The hanfu is also used as costuming in cosplay, where tradition and fantasy combine. ^ Leibold, James. More Than a Category: Han Supremacism on the Chinese Internet. The China Quarterly. September 2010, 203: 539–559. ^ 7.0 7.1 7.2 Kevin Carrico, A State of Warring Styles, "In reality, Hanfu is an invented style of dress that features broad sleeves, flowing robes, belted waists and vibrant colours. Its modern-day proponents claim it was the invention of the mythical Yellow Emperor and was worn for millennia by the Chinese people." ^ 8.0 8.1 张跣. 汉服运动：互联网时代的种族性民族主义. 中国青年政治学院学报. 2009, (04). ^ 周星. 新唐装、汉服与汉服运动——二十一世纪初叶中国有关“民族服装”的新动态. 《开放时代》. 2008, (3). ^ Carrico, Kevin. The Great Han: Race, Nationalism, and Tradition in China Today. Univ of California Press. 2017: 37–39. ISBN 978-0-520-29549-0. ^ Kevin Carrico. Make the Han Great Again. University of California Press. ^ 林良浩. 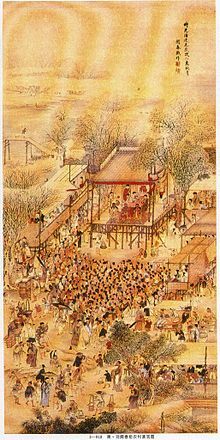 中国传统文化常识. 百花洲文艺出版社；Esphere Media (美国艾思传媒). 1 June 2010: 103–. ISBN 978-7-80742-860-2. ^ 111.0 111.1 Edward J. M. Rhoads. Manchus and Han: Ethnic Relations and Political Power in Late Qing and Early Republican China, 1861–1928. University of Washington Press. 2000: 61–. ISBN 978-0-295-98040-9. ^ 鄭天挺. 《清史探微》. 知書房出版集團. : 61. ^ Edward J. M. Rhoads. Manchus and Han: Ethnic Relations and Political Power in Late Qing and Early Republican China, 1861–1928. University of Washington Press. 2000: 60–. ISBN 978-0-295-98040-9. ^ 徐杰舜 (编). 《汉族民间衣食住行风俗》. 中國: 广西教育出版社. 1994-03: 第5页. ^ 方人定. 《我的写画经过及其转变》. 《再造社特刊》. 1941年. ^ 姜, 柯安. 《鄭州街頭有人公開穿著「漢服」，專家質疑「漢服復興」是商業炒作》. 《東方早報》. 2003-12-04. ^ 王, 勇幸. 《廣州街頭邂逅漢服迷》. 《信息時報》. 2008-08-06. ^ Kevin Carrico, A State of Warring Styles, "Wang’s ‘maverick’ photographs had a galvanising effect on netizens, and soon people were imitating his grandiloquent performance in cities throughout China. In this process, Han Clothing made the transition from a fantastic invented tradition to a distant image on a screen to a physical reality in the streets of China, in which one could wrap and recognise oneself." ^ Kevin Carrico, A State of Warring Styles, " In my time spent with movement participants, however, I found that despite this focus upon the past, the movement was primarily a product of the present and its contradictions, of which Han Clothing was at once a symptom and an attempted cure."